What You'll Need: scriptures, primary songbook, activity print outs, tape or poster putty. If making the treat please check the ingredients list below. When Heavenly Father created the earth He made everything work together perfectly. Each year we have four seasons. The seasons are each different and they all work together. SPRING - In Spring the snow melts from the winter and the sun starts to shine again. This helps flowers start to grow. We see trees start to get leaves again and sometimes it rains a lot in the Spring to help the new flowers grow. Spring is also a time when we see lots of baby animals. Spring is when we celebrate Valentine's Day, St. Patrick's Day and Easter. We also watch a session of General Conference each Spring. SUMMER - When the sun starts to shine even more it means Summer is here. In Summer the weather is hot. We wear shorts and tee shirts. There is no school, so children play in their backyards, at swimming pools and a lot of families go on vacation. Summer is when we celebrate Father's Day and the 4th of July. AUTUMN - In Autumn the weather starts to get cool and we wear jackets and sweaters. The leaves on the trees turn from bright green to beautiful colors of orange, red and yellow. Sometimes people call Autumn "Fall" because leaves start to fall off of the trees. Autumn is when school starts again. We celebrate going back to school, Halloween and Thanksgiving in the Autumn. We also watch a session of General Conference each Autumn. WINTER - Winter is the very coldest time of year. All of the leaves fall off of the trees and the only trees left with any color are evergreens. Snow falls on the ground and we start wearing coats, hats and mittens. We can play in the snow in a lot of different ways. Winter is the season when we celebrate Christmas and New Year's Eve. After New Year's Eve, we get a new Primary Teacher and move up to a new class at church. All throughout the year we can have fun by being together as a family. My favorite parts of each year are the times when we are together and have fun. Each year we all grow a little more and can learn more about Jesus Christ and Heavenly Father. Bear your testimony about how grateful you are for each Season and for the times throughout the year when you get to spend time together as a family. Practice Song: If you are teaching your family the April Song of the Month, go over the words and music with your family. 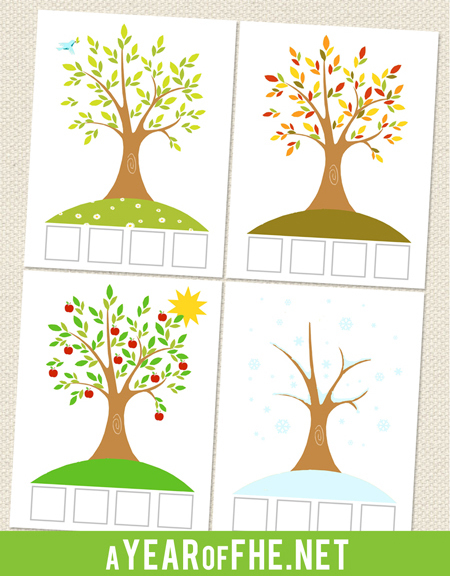 Download charts for the four seasons and the small activity squares that go with them. (If desired, laminate each Season page and cut out small activity squares and laminate as well). Have children take turns mounting a square in the box below the tree of the season it corresponds with. 2. Lay out a large sheet of wax paper to place balls on. 3. In a small sauce pan, combine Jello, sugar, butter, and corn syrup. 4. Cook on medium high heat until mixture comes to a full boil. Keep at boil for 2 minutes. 5. Pour mixture over popcorn and mini marshmallows and stir with a wooden spoon until popcorn is evenly coated. 6. Use buttered or wet hands and carefully (it will be hot!) form popcorn into 8-12 round balls, about the size of a baseball. 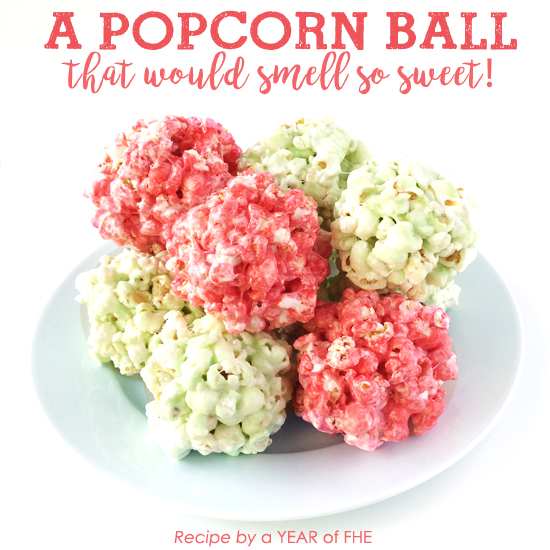 Set popcorn balls on to wax paper and allow to cool. 7. Wrap individual popcorn balls in plastic to store. I just found your blog through a friend. I love it! Thank you for sharing all your wonderful ideas. I love the visuals for this lesson, what a great activity for teaching categories and associations (I am a speech-lang. pathologist so am always looking for language applications :)! I just found your blog and am loving it. 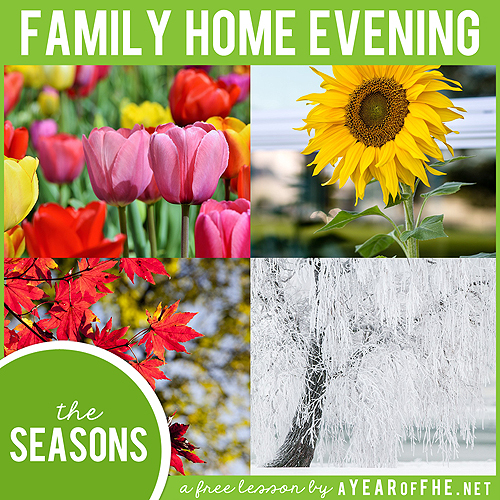 I printed out the seasons clip art and I am using it tonight for FHE. I will be back to plan more FHE lessons through your site. Thank you! Thanks for sharing! I like that I can use it with non-English speakers since there is no text! thank you this is a wonderful activity. I will pair it with the book "A Child's Calendar" by John Updike. I found these print outs via Pinterest. Super cute. I can't wait to check out the rest of your site. We loved your season sort printable and featured it at our blog, Preschool Printables! We were sure to give idea/photo credit, as well as a link back to your blog. [NOTE: We only feature a picture "preview" of the worksheet - our readers must come to your blog to download the printable.] We'd love for you to check it out and, if there are any problems, we'll be sure to take it down immediately! Thanks for sharing! Just found this through pinterest! Will definitely check back often! Thank-you for sharing your ideas. I like the layout, brief summary, and activity ideas. This is so cute! This is just what I needed. I love your site. Thanks for sharing. Thanks for sharing. I found your site through pinterest, perfect for what we are studying now. Thank you for sharing. I am a graduate student studying speech-language therapy and this will be a fun activity to have in the future! I work with students that have severe disabilities. This is a nice fine motor skills activity that supports the science curriculum. I like the graphics of it also. Wonderful! I found you through Pinterest, and I'm so glad I did. Thank you! Wow! I found you on Pinterest, and this is a perfect activity for what we are studying right now...Seasons! Thank you so much! The activity sheet you've created is a great follow-up to a lesson that I use with my K5 students. I've placed symbols of the seasons around the perimeter of a round table cloth, sun for summer, leaves for fall, snowflakes for winter and flowers for spring. I've collected various small seasonal items and each student takes one to place on the appropriate quarter of the cloth. Some are open to discussion and opinions. I'm bookmarking your site for inspiration to use with our church preschoolers! Thanks for your generosity. my son will find this fun! he is very hands on and loves to cut! simply perfect and very helpful! thanks for sharing! I cant figure out how to download the chart with the trees and seasons. I've done the installer 5 times. Help! I love this! I've downloaded and attempted to print, but it prints all wonky. Any suggestions? Also, it says it downloads as a pdf file, but I'm unable to find a way to print from a computer that's not my laptop where I downloaded. Again, it prints wonky. Any ideas would be helpful! I can't print in color from this computer. The link to download the lesson PDF is not working. It says the page cannot be found. Help! I love these and want to use them!